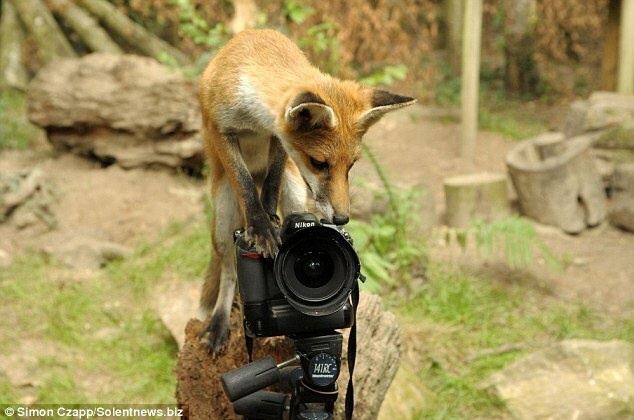 This clever cub became the ultimate wildlife photographer after outfoxing a professional and taking her own picture as he was snapping her. 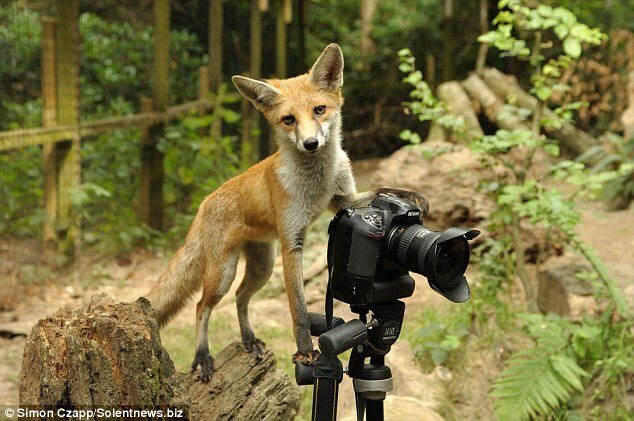 The inquisitive five-month-old vixen was so intrigued by the camera equipment she clambered right on top of it. And while she was supposed to be the subject of the shoot, the cub stood on the shutter release button and took her own frames. Simon Czapp, 25, visited the New Forest Wildlife Park to capture images of new arrival Jessie, named after Toy Story’s cowgirl. She has been rehoused at the animal park in Ashurst, Hampshire – home to wolves, wallabies, deer and otters in 25 acres of ancient woodland – after being abandoned by her mother. Jessie was offered a few scraps of ham to entice her into posing, but she quickly became so fascinated by the cameras she put on her own performance. Mr Czapp, from Eastleigh, said: ‘Jessie was very playful and inquisitive and not at all camera shy. ‘Soon after I arrived she was chewing my shoes and everything seemed to be a game to her. ‘Then she started exploring the camera I had set up on a tripod in her outdoor pen. ‘She stood on her hind legs to peer into the lens and then used a tree stump to get a better look at the back of the camera. He repositioned the camera on the tripod nearer the tree stump and Jessie soon hopped back up. At one point she had all four paws on the camera and was wobbling to keep her balance. Mr Czapp added: ‘She jumped up there several times and I realised it could make a good picture. ‘As I was snapping away with the public’s viewing window behind me, I thought I heard the camera go off but didn’t think much of it. ‘But when I checked the memory card afterwards, I was amazed to see Jessie had actually taken two frames of me photographing her. 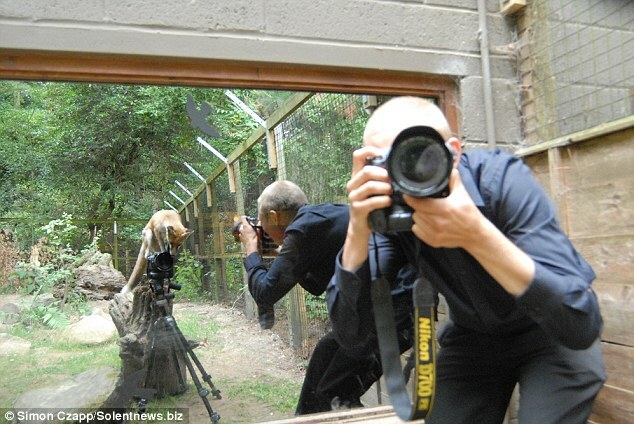 The wildlife park’s head keeper, Shanna Dymond, 29, witnessed the impromptu photo shoot. She said: ‘Jessie is a lovely little cub. She is very inquisitive and as soon as we go to see her, she runs up to say hello and wags her tail. Jessie and her pen mate, male fox cub Woody, were handed into an RSPCA centre in the spring but were too tame to be released into the wild. They have an indoor stable to sleep in and an outdoor pen where they have dug a retreat under rocks.